Apparently, according to ‘Jimmy the bike man’, (see Ici Bike post) the French bikes are beautifully made and they last and last. I have always fancied older Peugeots, and that goes for Peugeot folders as well. I have spotted a chap riding one past my place twice, but haven’t managed to stop him for a snap, (it takes a bit of bottle to flag someone down and ask if you can photograph their bike.) The second time I saw him I did manage to rush out on the balcony like some demented woman and call out “Peugeot folding bike – lovely!” as he sailed past. I think he looked back and smiled, but that might have been wishful thinking. Maybe I have warmed him up for next time. In the mean time, here are two Peugeot folders from the archive. Not the best photos, but what can you do? 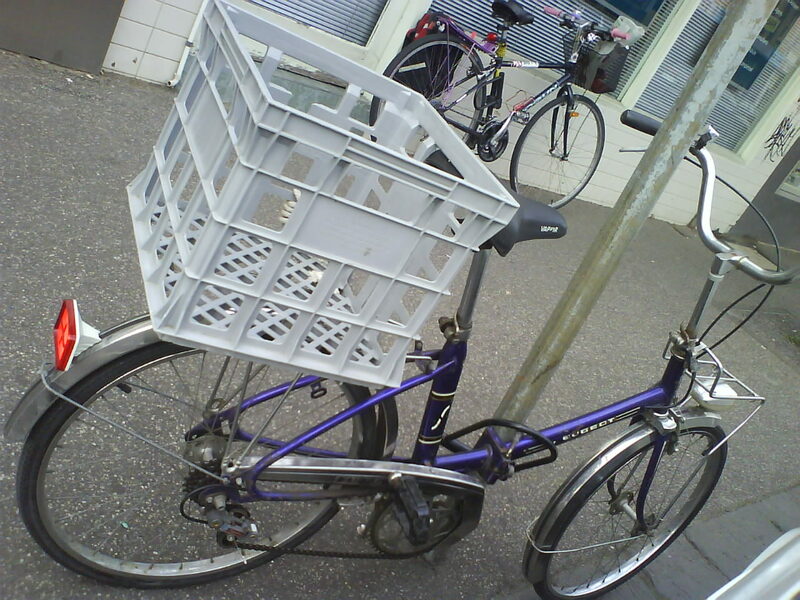 I have just picked up two Peugot folding bicycles,the wheel size is a bit of a problem, Cost wise. Anyway you have a nice site here. does that mean the bikes came without wheels I wonder? Hey there, I just bought a folding Peugeot nouveau, it’s absolutely BEAUTIFUL but my rear sprockets were so brittle on my first ride they snapped off when the chain came off 😦 ! I’m now looking to replace them (somehow!) They are amazing looking bikes though. ooh that’s tricky. If you are in Melbourne you could try Fitzroy Vintage bikes for getting your wheels mended or replaced ( I know they have bits of old nouveau in the workshop because I saw them when I dropped off my gitane for some mechanical loving last week).There’s a link on my front page. Oh I just read your comment again, I thought you said your SPOKES snapped off – had a weird picture of the bike just collapsing into the ground and spokes flying every where. Anyway, hope you get it sorted. Love the NS. What colour is it? Haha! Oh no that would be much worse! All the spokes/tyres and inner tubes are just great! It’s the resin derailleur sprockets that pretty much disintegrated on her maiden voyage 😦 I see you’ve replaced yours with sugino and shimano? Looking into doing something like that with mine! 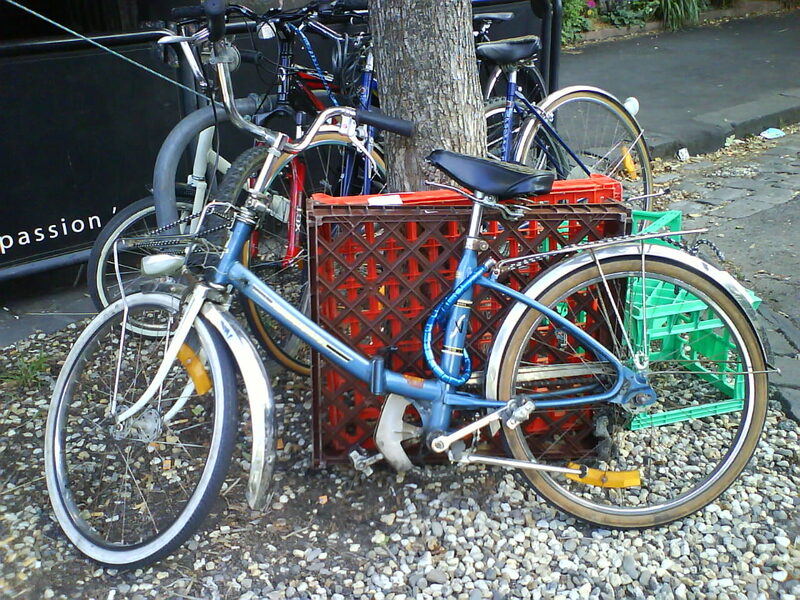 Actually I ride a Gitane…you must’ve been looking at a pic of someone else’s bike. 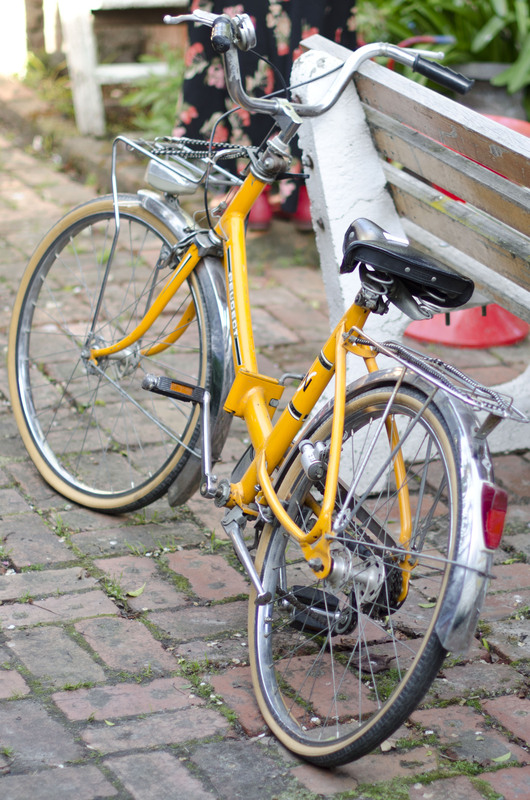 Nice photo, lovely bike, I haven’t seen many yellow NSs. Thanks for dropping by. Hello, The wheels are no longer a problem, I have updated them too 24 Inch alloy, plenty of parts for these.Although I did have to modify the brakes to fit the slightly larger wheels. Maybe a solution for L to consider? That seems to be a problem on all old Peugeots.The plastic sprockets disintegrate with time and age and eventually fall apart.I got rid of the gears altogther and converted mine to a single speed using a NOS Shimano coaster hub laced to the original rim. If you want to go the whole hog, then you could purchase some new 22″ rims from Velocity. Abbortsford cycles in Richmond can cut spokes to fit. …..and that’s all from me, bike nerd.